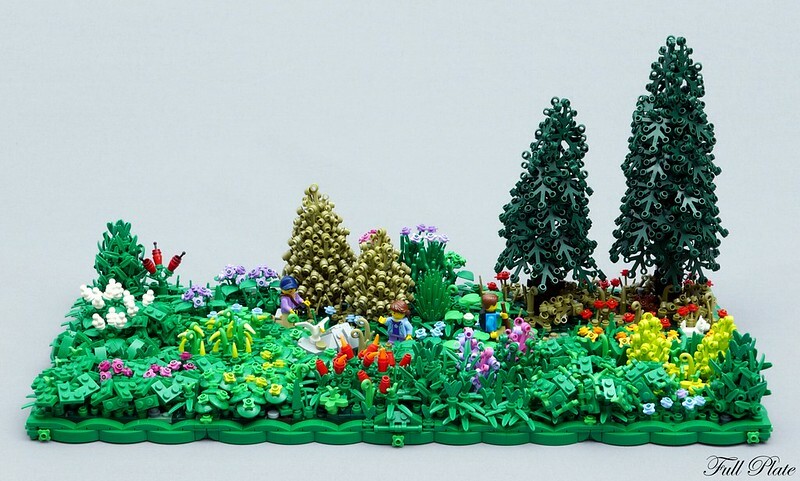 For my last entry to Rebrick’s ‘Help Decorate the LEGO House!’ contest I wanted to make a very lush landscape in minifig scale. I pretty recently finished my Abandoned Lot and I wanted to use the same style for this build, but again limited to the size constraints of the contest. I also wanted to try out some new techniques for vegetation. The first thing I built was the frame. 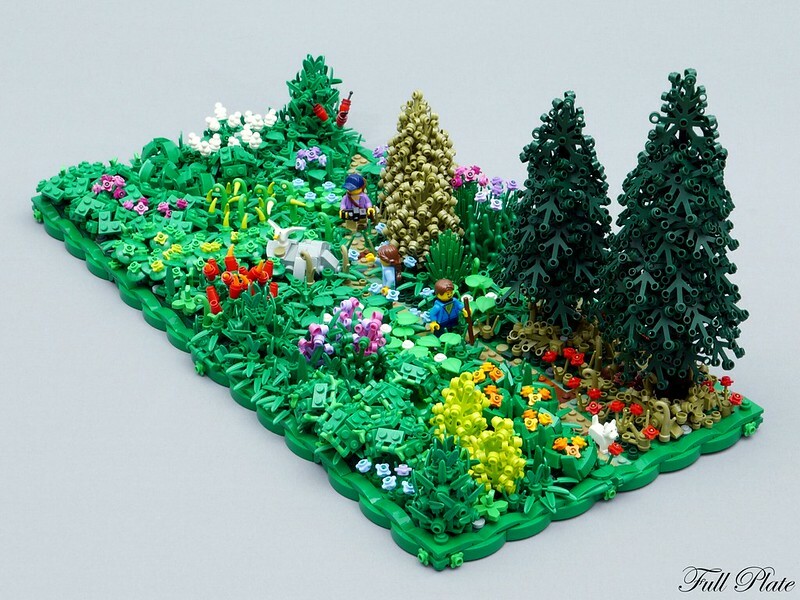 As I build a lot of nature I had been thinking of a suitable frame for that, and after some experimenting I came up with this technique which is flowy and green. 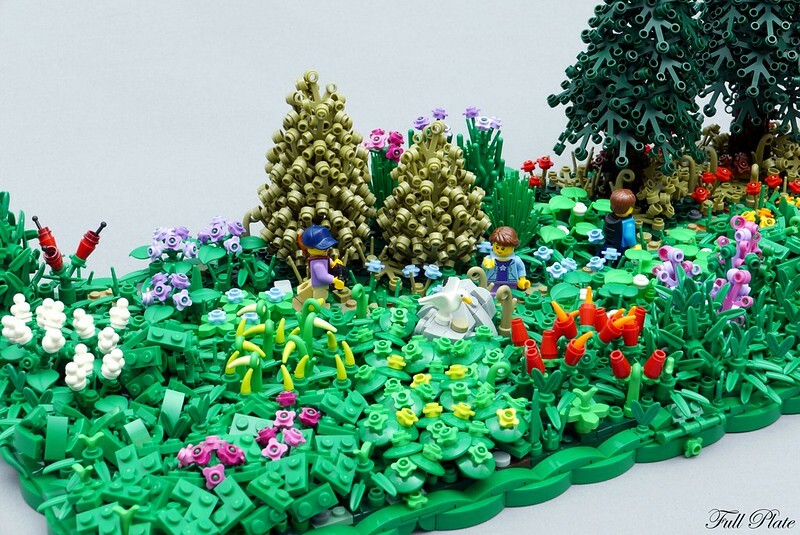 I feel it works in that it provides a defined border, but can also blend in well with the foliage in the build. I decided on a layout with a small walking path from the top left to the right side, with flowers and bushes in front, and trees and taller foliage behind. Adding foliage in front was pretty quick, as I have used some of these techniques before. I tried to have loosely defined areas for different types of flowers and bushes, while letting them flow into each other’s a bit, as I imagine it to be in nature. A boulder was added in the middle, as sort of an anchor point in the composition, which I feel is always needed in nature heavy builds like this one. 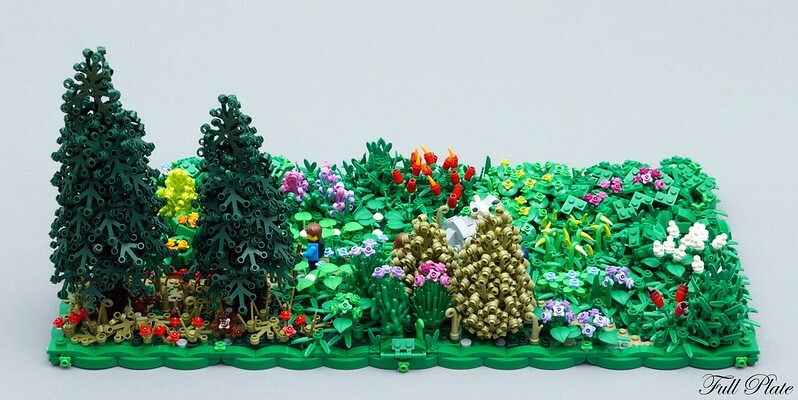 I really like the corner plate bushes in the bottom left corner, which I feel are both organic, but also very ‘Lego’ 🙂 Another new technique are the bushes with the clips holding small bright green stalks, on the right side. In the back I added a couple of medium sized spruces, accompanied by some tall bushes and flowers. 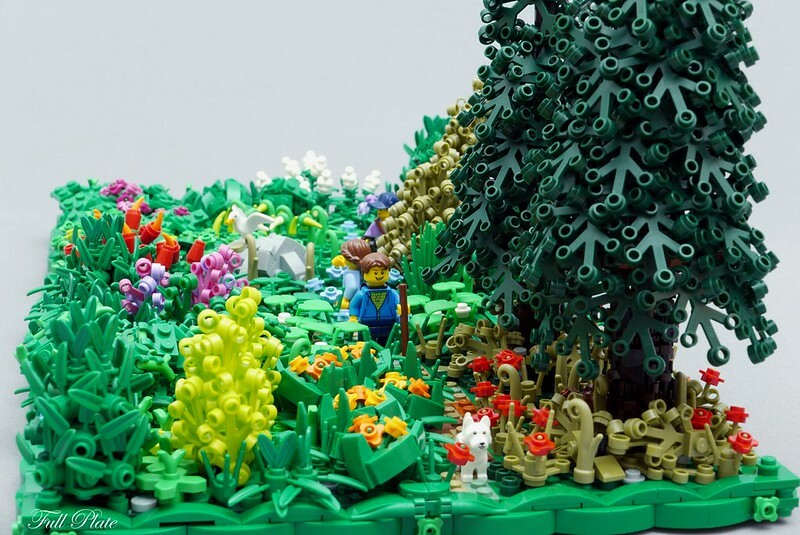 Although the taller vegetation works a bit like a backdrop for the minifigs on the trail, I still wanted to make the build pleasing to look at from the back. The colour theme goes more into olive green here, especially under the spruces, as these areas would generally be more dried up. In the back the daughter points out a bird on the rocks to her mother. 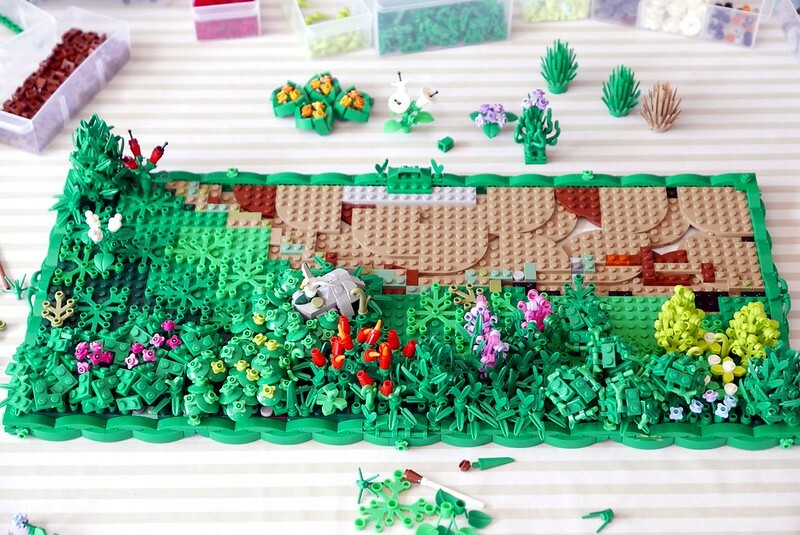 As a fun extra challenge I added 6 animals throughout the build, the bird and the dog being the most obvious, for spectators to find. Five of them can be spotted in the photos, can you find them?